Announcement Welcome to Moon & Leaf where everything is crafted by hand with love and an eye for beauty. 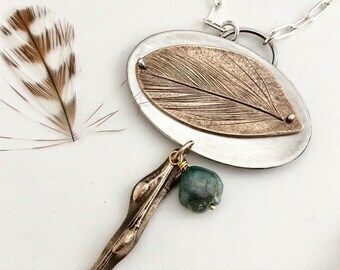 Bronze, silver, gemstones and vintage findings are combined to create pieces that link elements of nature and spirit to the power of personal expression and self adornment. We are all connected to each other, the plants, the animals, the Earth and the stars. May my pieces remind you of your connection with this great mystery and of the beauty that resides in you and in all that surrounds you. Welcome to Moon & Leaf where everything is crafted by hand with love and an eye for beauty. 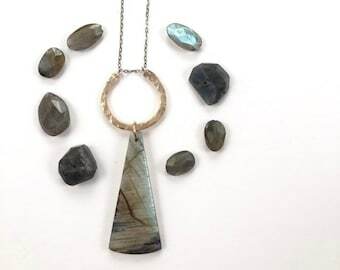 Bronze, silver, gemstones and vintage findings are combined to create pieces that link elements of nature and spirit to the power of personal expression and self adornment. We are all connected to each other, the plants, the animals, the Earth and the stars. May my pieces remind you of your connection with this great mystery and of the beauty that resides in you and in all that surrounds you. Beautiful colors in this stone. It reminds me of fall foliage up north. The Artist was very helpful. Thank you for my ring. You were a pleasure to work with. 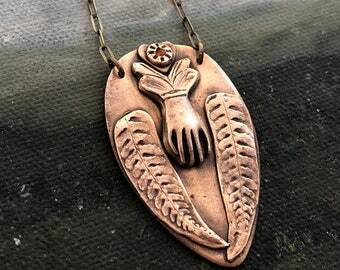 This might be the most beautiful necklace EVER! I’m in love, thank you! 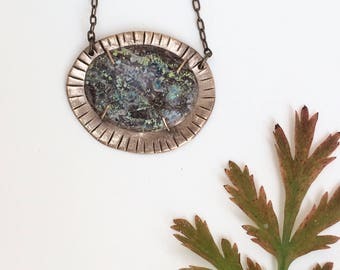 New jewelry is sneaking into the shop at last! In honor of the sun's return. Working with metal clay and etchings of my photographs to make a pendant. Soldering a finished bronze piece. Assembly at my favorite table. I love working with vintage findings and unique gemstones. All set up for a craft fair. a shop where beauty, divinity, and creativity mix. My most successful work develops from a surrender to the creative process and I have come to experience the making of art as a form of meditation and prayer. I work with Precious Metal Clay to make some of my bronze and silver designs. Metal in this form has a very soft and organic look which I favor as it conveys the feeling of being hand made. The metal in PMC is recycled and the process of working with PMC is non toxic and environmentally friendly. 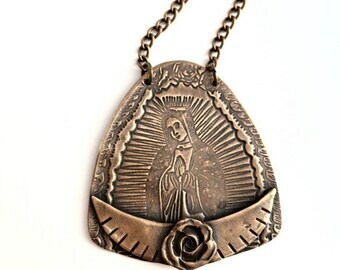 I use stamps, molds of vintage objects, and etchings of my own photographs to create each of my pieces. I also love vintage Native American jewelry and have collected it and sold it for many years. 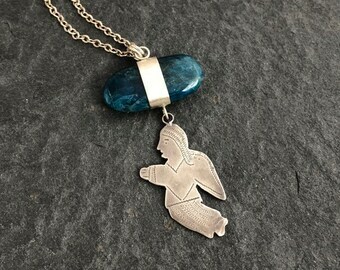 Native peoples believe that everything has a spirit including a piece of jewelry and I do think of the pieces I create, buy, and sell as small entities with their own energy. The moments that I devote to creating give me the greatest joy, and the pieces I create are little reminders to me of my connection with the great mystery. They are like little altars that I can hang on my wall or wear around my neck in celebration of everything from the leaf on a tree to the moon in the sky. I opened this shop so I could share these creations with others. Let's surround ourselves with beauty and joy and dive into the richness that this world has to offer. I am a jewelry designer, photographer, entrepreneur, and a mom. I adore beauty, magic, and creativity and I see art as the truest expression of these things. I love religious artifacts and have been known to talk to the moon.